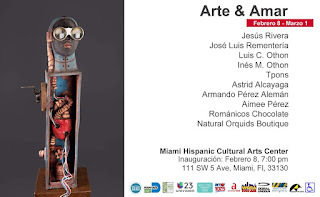 Creation Art Center invites to the opening of the Arte & Amar exhibition at the Miami Hispanic Cultural Arts Center (111 SW 5 Ave, Miami, Fl 33130), on Friday, February 8, from 7: 00-9: 00 pm. Arte & Amar is a collective exhibition dedicated to the celebration of Valentine’s Day. For that reason, in addition to painting and sculpture, there will also be a display of jewelry, chocolates, music and flowers. The exhibition contains an installation and a sculptural piece by Jesús Rivera; painting in acrylic and pencil by José Luis Rementería; stained glass windows by the brothers Inés and Luis Othon; acrylic on canvas and furniture by Astrid Alcayaga; murals in terracotta from TPons, sculptures by Armando Pérez Alemán, Yeins Gómez and Aimee Pérez. 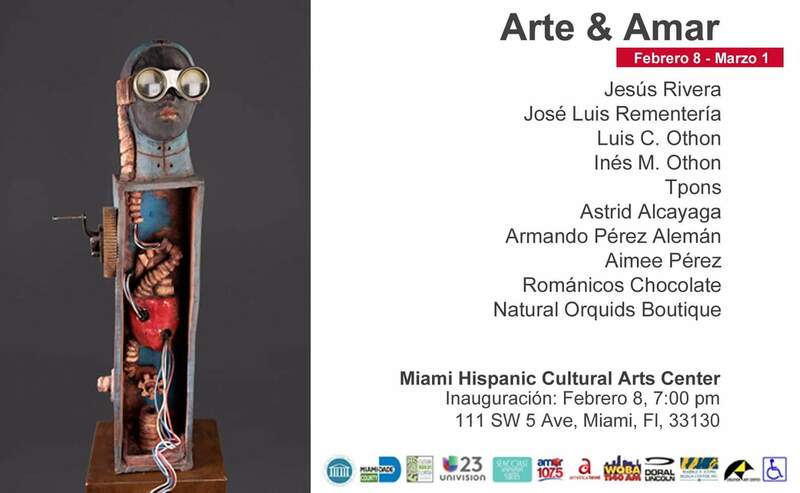 The exhibit will be open to the Public at the Miami Hispanic Cultural Arts Center every day from 10:00 am to 8:00 pm. till March 1.